Terminal blocks crossing panels and keystones have connectors that can be apprenticeship with a popular networking tools called cross-connecting knife or insertion tool connection knife. 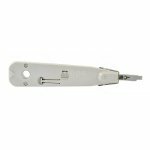 Tool for jackets removing from the UTP / STP cables CAT5, CAT5E, CAT6 and cables with larger outer diameter. 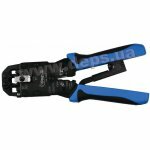 Crimp Pliers (3 in 1) for cables of Cat 5 and Cat 5e. Is designed for crimping connectors type RJ45/8P8C, RJ12/6P6C, RJ11/6P4C, RJ9/4P4C, RJ10/4P2C. 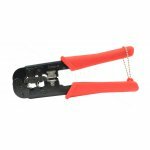 Crimp Tool UA-3021 is equipped with isolation removal, combined with a tool for mounting patch panels.